Continuing on the theme of providing an Indian dish for you each week, through the month of June, as part of Curry for Change, I hereby introduce a curry that I imagine many of you have never come across before – Lotus Seeds – otherwise known in India, as Phool Makhana. 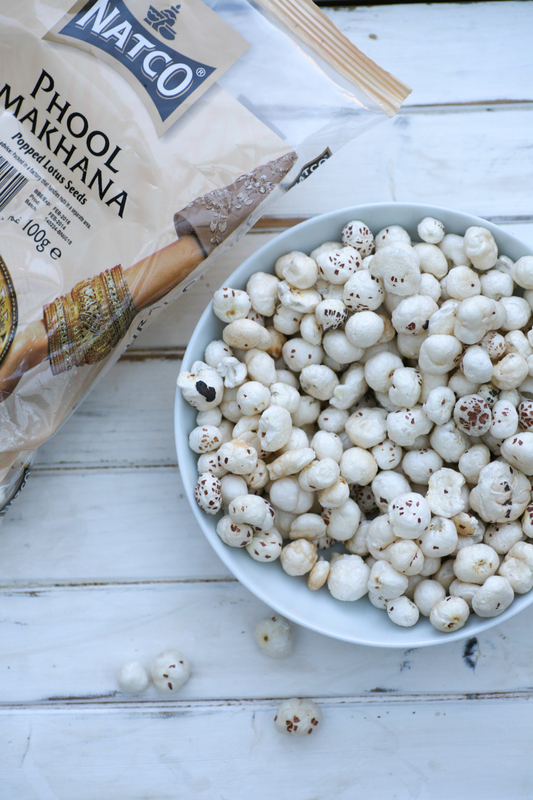 When Natco foods sent me a huge box of goodies for me to create a dish as part of a competition for food bloggers, (more about this click here from last weeks post), a large packet of phool makhana – popped lotus seeds – definitely stood out. They look very similar to popcorn or little cotton balls. In all honesty I had not eaten or even seen lotus seeds before, which was even more of a reason to experiment and give them a try. I discovered that they are greatly valued for their nutritional (powerful antioxidants) and healing properties, especially in Chinese medicine. In India, the state of Bihar produces the most amount of lotus seeds, largely owing to it’s climate and geography. They are grown in stagnant water of wetlands, ponds and lakes and are completely organic. The seeds themselves can be eaten raw, fried or toasted – I opted for the latter as I was putting them in a curry. 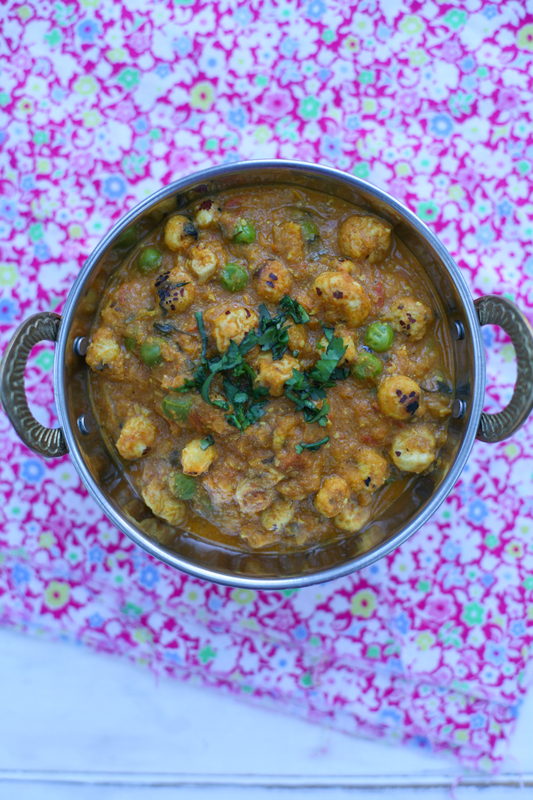 This curry is a winner for anyone wanting to avoid meat. It’s quick and easy to execute and kind on your waste line. It’s also rather tasty! 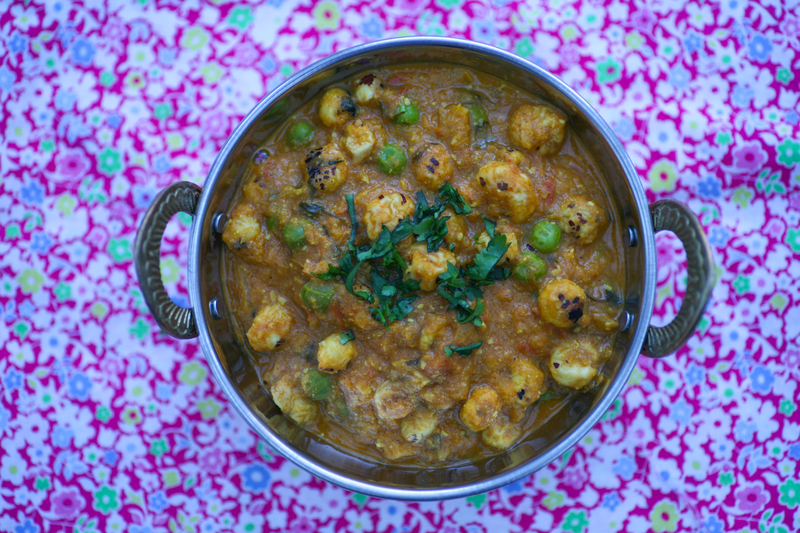 We try to have meat free mondays, so this curry will definitely be making more appearances going forward. Have a look out for the seeds when you next visit your local Asian grocers. 1. Place the olive oil in a non-stick saucepan and gently fry, stirring continuously, the lotus seeds for 5 minutes to allow them to bronze slightly and crisp up. 2. Place in a bowl and leave to one side. 3. In the same non-stick pan gently fry the onion for 5 minutes to allow to soften and become translucent. Add the garlic ginger paste and stir into the onions. After a minute, add the tomatoes and stir into the other ingredients. 4. Now add the Kashmiri chilli powered, turmeric, coriander powder, garam masala and salt. Stir well and leave to simmer for 3 minutes. 5. Transfer the contents of the pan into a blender and then return to the blender once you have a smooth sauce. Continue to simmer for a couple of minutes. 6. Place the cashew nuts, and the water they are soaking in, into a blender to form a paste. I find that my spice grinder works well at blending the nuts smoothly (do not add the water to the spice grinder!) and then stir into the water after they have been ground up. Add to the main pan and simmer for a minute. 7. 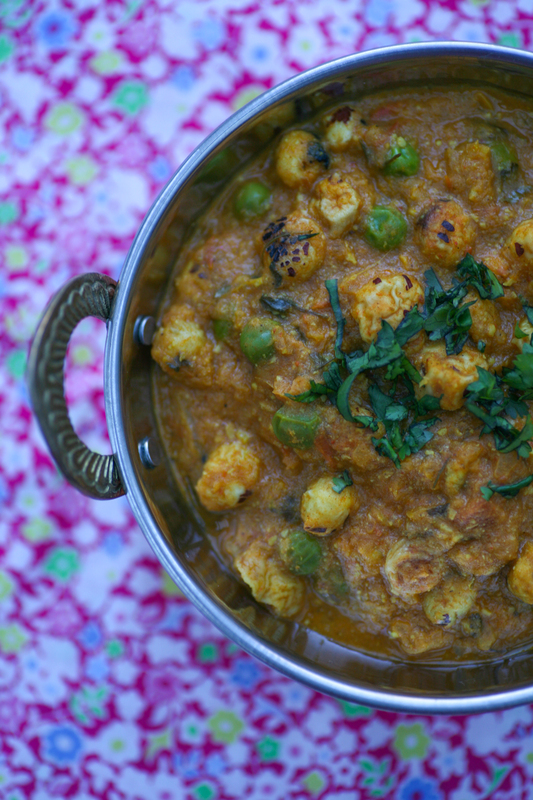 Add the dried fenugreek/methi leaves and the peas and stir into the smooth sauce along with 200ml of water and simmer. 8. After 5 minutes add the lotus seed and stir thoroughly into the sauce. Simmer for a further couple of minutes then serve. 9. Serve with some chopped fresh coriander and a wedge of lemon. This entry was posted in Curry and tagged curry, curry for change, find your feet, Indian, lotus seed, natco foods, phool makhana. Bookmark the permalink. Wow! this looks yummy. These seeds looks like pop corns, I have seen this around the store I will definitely try this recipe. Look forward to trying this Torie – bought some lotus seeds in Myanmar and never figured out what to do with them…until now! Hi George, Did you eat them out in Myanmar at all? How did they cook with them there? Let me know what you think of this curry. We all loved it.